The key light transmission supports the translucent effect of the font, and the brightness of the light transmission is adjustable; the key aperture (marquee) LED displays the feedback status, and the brightness of the LED light is adjustable. Feedback LED color and backlight LED color can be selected. 1. Dimming, switching, scene control and display through I0 port; 2. Temperature accuracy can be adjusted by tools, temperature acquisition accuracy of 0.1 degrees; 3. Color display temperature, mode, wind speed, set different modes or temperatures, the picture shows The color can change automatically: heating - red, cooling - blue, air supply + dehumidification - no color. The programming software platform freely defines the function of each key. The device operates with a 5 to 24 VDC DC power supply and is less than 25 mA of power consumption. The keypad panel enters the standby power saving mode, and the key backlight indicator automatically saves power through distance sensing. This design meets the needs of low carbon and environmental protection. The double panel adopts the connecting buckle to connect the two standard dedicated 86 back boxes and install them to make the panels more neatly installed. The EWIG series of key panels is a standard, cost-effective, smart keypad solution offered by SCHIDERON. 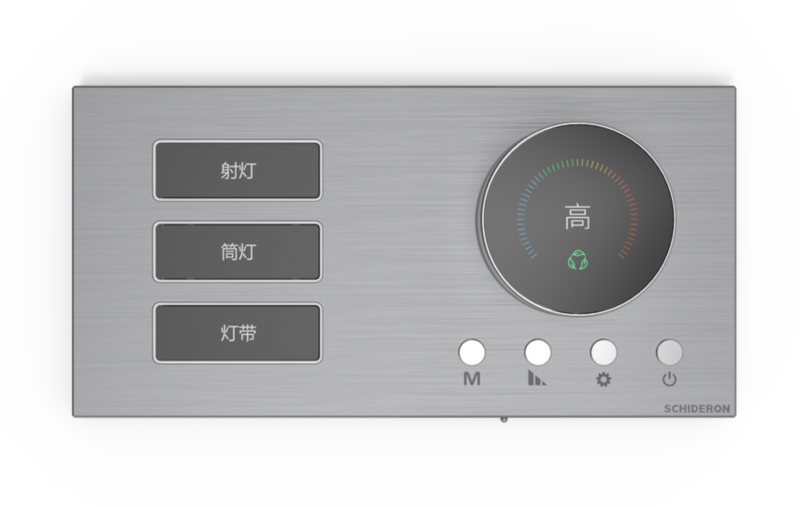 It adopts an integrated custom design, the appearance is more concise and noble, the keys can be carved light and the marquee design is used to display the real-time control status. With configurable intelligent buttons, it can be easily installed in a special bottom box. The safe voltage of the intelligent button panel device is very easy to install on the wall as part of a complete intelligent control system. This button panel also provides a variety of different colors and styles of metal frame for different occasions or personal use, EWIG-KP302-AL-2G is one of the EWIG series products, in line with the needs of customization. EWIG series panels are popular with designers and are widely used in various hotel and smart home projects.